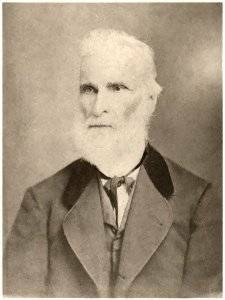 James Whittle (State Senator 1861-1863) was the son of a prosperous and well-known family in Mecklenburg County, Virginia. Upon his graduation from Hampden-Sydney College, he came to bustling Pittsylvania Courthouse (now Chatham) to establish a law practice in the early 1830's. Whittle married a local girl, Mary Coles. They lived at the property now known as The Columns on South Main Street in Chatham. Mary Coles Whittle died after the birth of their daughter Mary. Whittle then married his cousin Cornelia Skipwith of Mecklenburg County. They built and lived at Eldon, just east of Chatham. Cornelia died after the birth of their daughter Matoaka. At his death, Whittle owned significant portions of Chatham and adjacent land on the west side of town along the railroad, and over 5,000 acres of land in Pittsylvania County including his beloved Eldon. 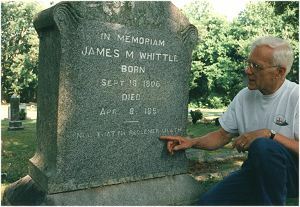 Anecdotes from the period indicate that James Whittle was highly reputed for his honor, integrity, and Christian devotion. His marker in the Chatham Burial Park is inscribed, "I know that my Redeemer liveth." James Whittle's great-great-grandson, the Rev. Mark E. Waldo, Sr., points out the inscription. Portrait of James M. Whittle is the property of Mark E. Waldo, Sr., descendant; digital restoration is by Marilyn Sell. See June 27, 1861, letter from Powhatan Whittle to James Whittle. Extensive records involving the families of James Whittle's father Fortescue Whittle and uncle Conway Whittle I are found in the Conway Whittle Papers, 1773-1911 , Earl Greg Swem Library, Department of Manuscripts and Rare Books, The College of William and Mary, Williamsburg, Virginia (see thorough description at the end of "Series C, Holdings of the Earl Gregg Swem Library: Miscellaneous Collections, 1773-1938"). Information about James Whittle's boyhood home near South Hill, Virginia, is posted as part of the W. P. A. Virginia Historical Inventory Project in files for Millbank and its cemetery.